The National League of Professional Baseball Clubs, or simply the National League (NL), is the older of the two leagues constituting Major League Baseball, and the world's oldest extant professional team-sports league. Founded on February 2, 1876, to replace the National Association of Professional Base Ball Players, it is sometimes called the Senior Circuit in contrast to the Junior Circuit of the American League, established as a major league in 1901. While club president of the Chicago White Stockings baseball club in the National Association, William Hulbert became fed up with the circuit's lack of definite structure, organization, and integrity. His vision for a new league founded on the principles of square dealings, recognition of contracts, and business integrity resulted in the formation of the new league. In 1903, The champions from the National League and American League arranged to meet in the World Series to determine the world champion. With the exception of the 1904 season and the lockout shortened 1994 season, Major League Baseball has formed a tradition of the two leagues coming together to culminate the American baseball season. Statistically, National League teams have won 42 and lost 61 of the 103 World Series played between these two leagues from 1903 to 2007. In 1858, the game of baseball evolved into an organized league, the National Association of Professional Base Ball Players, and followed a set of rules known as the Knickerbocker Rules, developed by Alexander Cartwright. The rules of the modern game are based on these by-laws. By 1875, the National Association of Professional Base Ball Players (N.A.) was weakening. The N.A. suffered from a lack of strong authority over clubs, unsupervised scheduling, unstable membership, dominance by one team, and an extremely low $10 entry fee. William Hulbert, a Chicago businessman and officer of the Chicago White Stockings approached several National Association clubs with the plan for a league with stronger central authority and exclusive territories in larger cities only. In other words, a league run by owners rather than the players. Additionally, Hulbert had a vested interest in separating from the National Association because he had signed five of his star players through questionable means, thus, risked their expulsion from the N.A. After recruiting St. Louis privately, four western clubs met in Louisville, Kentucky, in January 1876. With Hulbert speaking for the four in New York City on February 2, 1876, the National League was established with eight charter members. The National League's formation meant the end of the National Association, as its remaining clubs shut down or reverted to amateur or minor status. The only strong club from 1875 excluded in 1876 was a second one in Philadelphia, often called the White Stockings or Phillies. When the National League came into its own, the new league consisted of four western teams (Chicago, Cincinnati, St. Louis, and Louisville) and four eastern teams (Hartford, New York, Boston, and Philadelphia). The National League enforced a schedule of seventy games (ten games against each team). The first pennant in league history was won by Hulbert's Chicago White Stockings (now known as the Cubs), who were led by Al Spalding, one of the league's best pitchers (and one of players taken from Boston). During the off season, the league elected Hulbert president, who then used his authority to eliminate the New York Mutuals and the Philadelphia Athletics for not having honored their entire schedules when doing so would have been financially difficult. In other words, Hulbert demonstrated the competitive integrity of the game and the league itself. As a result, the NL played with six teams in 1877 (and a 60-game schedule). However, a gambling scandal involving second-place Louisville, which had looked like a pennant-bound team until it began losing in unlikely ways in the second half of the season, led to the banning for life of four players, showing the new league was serious about its integrity. The National League (N.L.) operated with six clubs during 1877 and 1878. Over the next several years, teams joined and left the struggling league, except for the Boston and Chicago members. When all eight participants for 1881 returned for 1882, the first off season without turnover in membership, the "circuit" was two nearly straight lines between the anchor cities, with Detroit, Buffalo, Troy, and Worcester on the northern route, and Providence and Cleveland constituting its southern route. The N.L. encountered its first strong rival organization when the American Association (A.A.) began play in 1882, although direct competition was merely impending, with the A.A. circuit a distant southerly line stretching from St. Louis to Philadelphia. The A.A. offered Sunday games and alcoholic beverages in locales where permitted, and it sold cheaper tickets everywhere (25 cents versus the N.L. 's standard 50 cents, a hefty sum for many in 1882). Locations of Major League Baseball(MLB) teams, marked by league and divisions. In 1883, the New York Giants and Philadelphia Phillies began league play. Both teams remain in the N.L. today, the Phillies in their original city and the Giants now in San Francisco. The National League and American Association participated in a version of the World Series seven times during their ten-year coexistence, though the series were only exhibition games arranged by the teams involved. The N.L. won most of those encounters, while some ended in ties due to disputes or other issues. After the 1891 season, the A.A. disbanded and merged with the N.L., which became known legally for the next decade as the National League and American Association. The teams now known as the Cincinnati Reds, Los Angeles Dodgers (in Brooklyn), and Pittsburgh Pirates (as well as the now defunct Cleveland Spiders) had already switched from the A.A. to the N.L. prior to 1892. With the merger, the N.L. absorbed the team now known as the St. Louis Cardinals, along with three other teams which did not survive into the twentieth century. While four teams from the A.A. moved to the N.L. and remain there today, only two original N.L. franchises remain in the league: The Chicago Cubs and Atlanta Braves (then in Boston). The Cubs are the only charter member to play continuously in the same city. The National League became a 12-team circuit with monopoly status for the rest of the decade. The league became embroiled in numerous internal conflicts, not the least of which was a plan supported by some owners (and bitterly opposed by others) to form a "trust," wherein there would be one common ownership of all twelve N.L. teams. The N.L. used its monopoly power to force a $2,400 limit on annual player wages in 1894. The league contracted to eight teams for the 1900 season, eliminating its teams in Baltimore, Cleveland, Louisville (which has never had another major league team since), and Washington. This provided an opportunity for competition. Three of those cities received franchises in the new American League in 1901. The A.L. declined to renew its National Agreement membership when it expired, and on January 28, 1901, officially declared itself a second major league. By 1903, the upstart A.L. had located teams in Boston, Chicago, New York City, Philadelphia, and St. Louis. Only the Cincinnati Reds and Pittsburgh Pirates had no A.L. team in their markets. The National League at first refused to recognize the new league, but reality set in as talent and money drained away to the new league. After two years of bitter contention a new version of the National Agreement was signed in 1903. This meant formal acceptance of each league by the other as an equal partner in major league baseball. Major League Baseball (MLB) narrowly averted radical reorganization in November, 1920. Dissatisfied with American League President and National Commission head Ban Johnson, N.L. owners dissolved the league on November 8, during heated talks on MLB reorganization in the wake of the Black Sox Scandal. Simultaneously, three A.L. teams also hostile to Johnson (New York Yankees, Boston Red Sox, and Chicago White Sox) withdrew from the A.L. and the 11 teams formed a new N.L. ; the 12th team would be whichever of the remaining five A.L. teams loyal to Johnson first chose to join; if none did so an expansion team would have been placed in Detroit, by far the largest one-team city at that time. Four days later, on November 12, both sides met (without Johnson), agreed to restore the two leagues and replace the ineffective National Commission with a one-man Commissioner in the person of Federal Judge Kenesaw Mountain Landis. The National League circuit did not change until 1953, when the Braves moved from Boston to Milwaukee; in 1966, the club moved on to Atlanta. In 1958, the Brooklyn Dodgers and New York Giants moved to Los Angeles and San Francisco, respectively, bringing major league baseball to the West Coast of the U.S. for the first time. Pittsburgh Pirates, joined from A.A.
Brooklyn Dodgers (now the Los Angeles Dodgers), joined from A.A.
Boston Beaneaters (now the Atlanta Braves), N.L. charter member, originated in N.A. Chicago White Stockings or Colts (now the Chicago Cubs), N.L. charter member, originated in N.A. The N.L. remained an eight team league for over 60 years. 1958: New York Giants move to San Francisco and Brooklyn Dodgers move to Los Angeles. In 1962, facing competition from the Continental League and confronted by the unilateral expansion of the American League in 1960, the National League added the New York Mets and the Houston Colt .45s. The "Colts" would be renamed the Houston Astros three years later in 1965. In 1969, the league added the San Diego Padres and the Montreal Expos (now the Washington Nationals), becoming a 12-team league for the first time since 1899. In 1993, the league expanded to 14 teams, adding the Colorado Rockies and the Florida Marlins. In 1998, the Arizona Diamondbacks became the league's fifteenth franchise, and the Milwaukee Brewers moved from the American League to the National, to make the National League the 16-team league it is today. 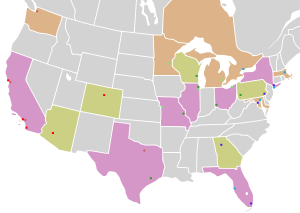 As a result of expansion to 12 teams in 1969, the National League, which for the first 93 years of its existence competed equally in a single grouping, was reorganized into two divisions of six teams (East and West, although geographically it was more like North and South), with the division champions meeting in the National League Championship Series (an additional round of postseason competition) for the right to advance to the World Series. Beginning with the 1994 season, the league has been divided into three geographical divisions (East and West, currently each with five teams, and Central, currently with six teams; from 1994-97 the West and Central each had one team less). A third postseason round was added at the same time: the three division champions plus a wild card team (the team with the best record among those finishing in second place) now advance to the preliminary National League Division Series. However, due to a player's strike, the postseason was not actually held in 1994. Often characterized as being a more "traditional" or "pure" league, the National League has never adopted the designated hitter rule as did the American League in 1973. In theory, this means the role of the manager is greater in the National League than in the American, because the N.L. manager must take offense into account when making pitching substitutions and vice versa. Overall, there are fewer home runs and runs scored in the National League than in the American due to the presence of the pitcher in the N.L. batting order. For the first 96 years of its coexistence with the American League, National League teams faced their A.L. counterparts only in exhibition games or in the World Series. Beginning in 1997, however, interleague games have been played during the regular season, and count in the standings. Through the 2007 season, the Dodgers have won the most National League pennants (21, plus one A.A. pennant), followed closely by the Giants (20) and Cardinals (17, plus 4 A.A. pennants). Representing the National League against the American, the Cardinals have won the most World Series (10) followed by the Dodgers (6), Pirates (5), and Giants (5). St. Louis also holds the distinction of being the only A.A. club to defeat an N.L. club in the nineteenth century version of the World Series. The President's office was eliminated in 1999, although Bill Giles, son of former N.L. President Warren C. Giles, currently holds the title of honorary National League president. The National League is the oldest existing league in any sport and has established a sense of tradition and camaraderie in the different cities by way of baseball. It has evolved into the national pastime of the country, and is one of the four major sports in the United States, along with the National Basketball Association, the National Football League, and the National Hockey League. ↑ Sports Encyclopedia, William Hulbert. Retrieved August 21, 2008. ↑ Leonard Koppett, Koppett's Concise History of Major League Baseball (Philadelphia: Temple University Press, 1998, ISBN 1566396387). A Baseball Century: The First 100 Years of the National League. 1976. New York: Macmillan. ISBN 0025103806. Allen, Lee. 1965. The National League Story, The Official History. New York: Hill & Wang. OCLC 722677. Dickey, Glenn. 1982. The History of National League Baseball, Since 1876. New York: Stein and Day. ISBN 0812861019. Melville, Tom. 2001. Early Baseball and the Rise of the National League. Jefferson, N.C.: McFarland. ISBN 0786409622. All links retrieved November 9, 2018. 19th Century Base Ball 19cbaseball.com. This page was last modified on 9 November 2018, at 18:06.